Your website can not simply just grab attention. The purpose of your website is to captivate and connect with the user, while also informing them about your brand and bringing their attention to your product or service. In the online world, first impressions are critical to success, and our beautiful website designs are the key to achieving that goal. Appealing aesthetics and user friendliness are what users enjoy most. Allow our team to build you a website that meets all your needs while also integrating all the design features we know your customers will love and want to come back to! 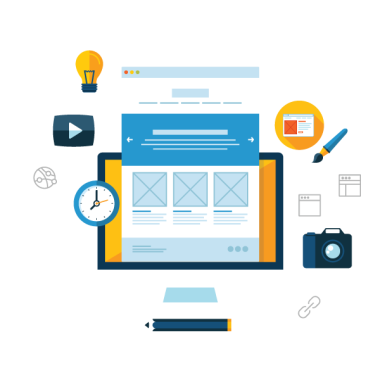 By utilizing our superior design styling we'll build you a website that integrates your brand and its personality to help your business achieve recognition in the digital world. Our custom designs will give your website uniqueness and will forever have an impact on your brand. We will present, revise, and continue to tweak our designs until we create the perfect website for your company. We strongly believe that working closely together on your web design will lead to beautiful results! From the start of the project with content auditing to publishing the final product, we collaborate and discuss your need and requirements at each step of the process. Only this way can we create a design that you and your customers will both love, and use to the full. Each and every project has its own goals, target audience, and customizations. Our team's approach to these challenges begins with a trusted process that will uncover the best way to meet your needs.